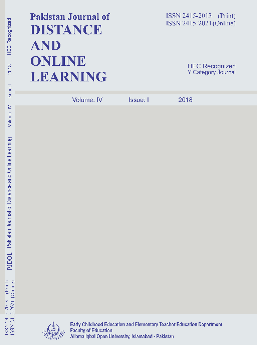 The purpose of the study was to predict academic achievement of distance learners from Locus of Control. The study was delimited to teacher education Programs (M.A., M.Ed and B.Ed) offered by universities of Pakistan through distance learning mode. A total number of 1513 students was selected through stratified sampling technique. The Nowicki-Duke Locus of Control Scale developed by Duke and Nowicki (1974) was administered to check the locus of control of distance learners. A pilot study was also done (randomly selected 100 distance learners) to validate the scale. The expert opinion of 05 experts was sought and test-retest reliability (.81*) of the scale was also checked. Final exam grades were taken to measure the academic achievement of students. Data analysis was done by using mean, percentage and regression analysis technique. The findings of the study indicated that distance learners with internal LOC had high achievements and those with external LO C had low achievements. 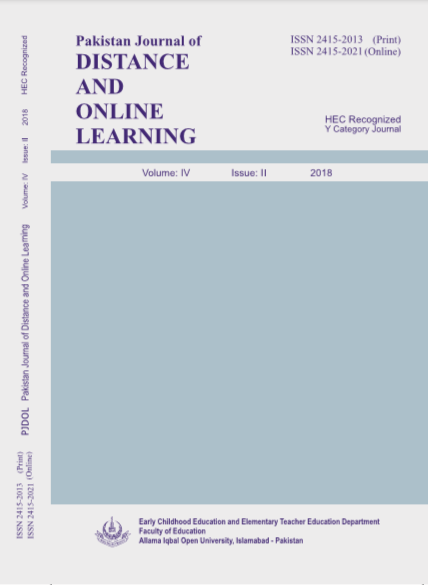 It was recommended that the prediction of distance learners’ achievements from LOC generated the need intervention training program for low achievers so that they may improve their performance.